The 24 mile accessible Merrymeeting trail will once again make the Augusta Lower Road rail corridor an asset for the region. Merrymeeting trail connects the Androscoggin River Bicycle pedestrian Path in Topsham, downtown Bowdoinham, Richmond, Gardiner, and the Kennebec River Rail Trail. The downtown connections make it easy for people using the trail to access downtown’s and visit businesses and restaurants. Merrymeeting Bay is a place with statewide ecological significance and one of only four locations in the world where two major rivers meet at their mouths to form a freshwater tidal delta. Much of the shore of Merrymeeting Bay does not currently have public access. This trail will provide a way for people to view and access the Bay and experience this hidden jewel in mid-coast Maine. Merrymeeting trail is an off road trail. In 2017, Maine had 20 pedestrian deaths, and a safe off-road route for pedestrians and bicycles can help to save lives. 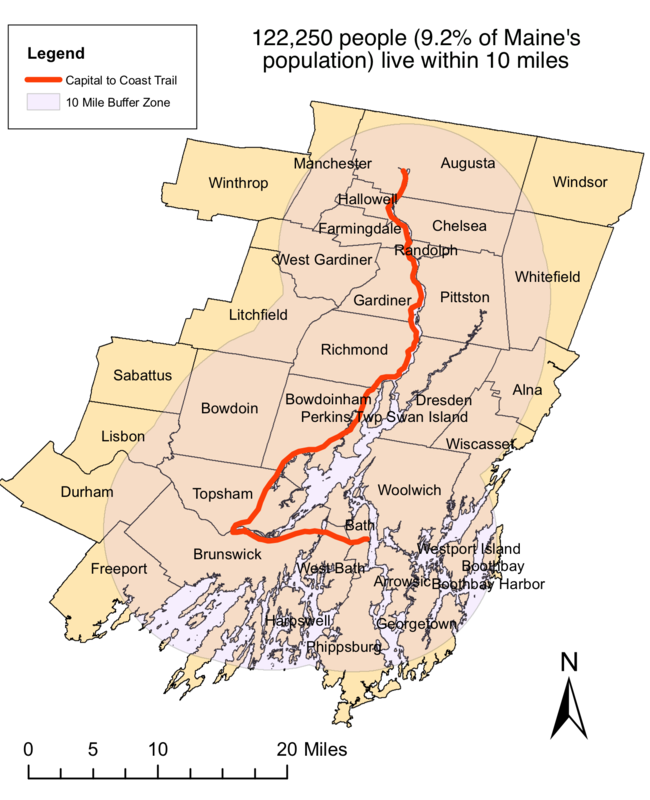 East Coast Greenway – Vision of a 3,000 mile walking and biking trail between Maine and Florida. The effort is coordinated by the East Coast Greenway Alliance and would connect 15 states and 450 cities/towns in the nations longest trail system. The Merrymeeting Trail could serve as an alternate route for this trail. The Communications report identified that Merrymeeting Trail and the three other trails that compose the Capital to Coast Trail system could have an estimated economic impact of $1 million – $10 million per year in trail user spending on hard goods, soft goods, and accommodations. The Capital to Coast Communications Report highlights research that shows people tend to exercise more if they have access to nearby trails. This exercise translates to better health, and has been shown to correlate to a $300 reduction in per-capita medical costs. Within 20 miles of Merrymeeting Trail and the three other trails in the Capital to Coast Trail system, there are 122,000 people that would have immediate access to these benefits.